Gals, check out my latest video for Daily Makeover in which I recommend three fabulous items in the $50-100 price range. They’re guaranteed to knock the socks off of any recipient! 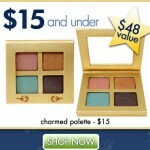 ← 20% Off Stila Cosmetics! I really love the shirt you are wearing in that video! Where did you get it?